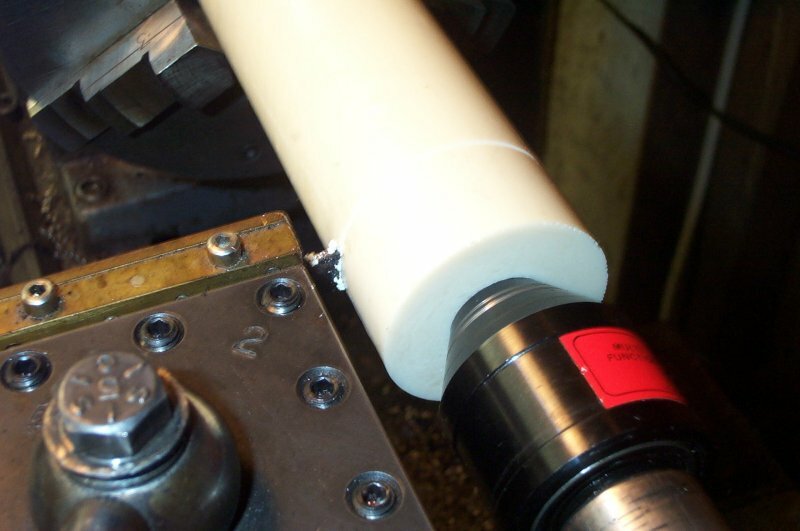 The basic steps include center boring, roughing the cylinder, cutting primary diameters, making and attaching projecting mount blanks, and final profile turning. This page details these steps. Turning blanks start out square in section. 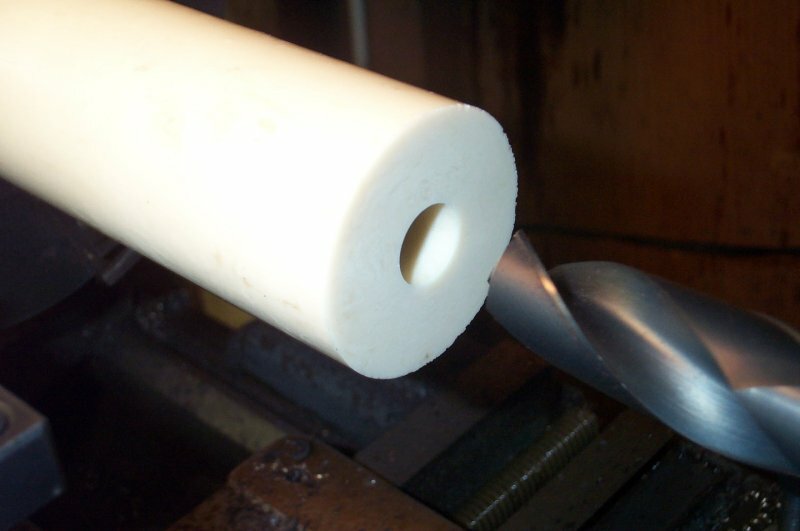 In traditional turning, the square is initially rounded with a roughing gouge. One end of the blank is centered and held in a 4-jaw chuck while the other is held in a live center. 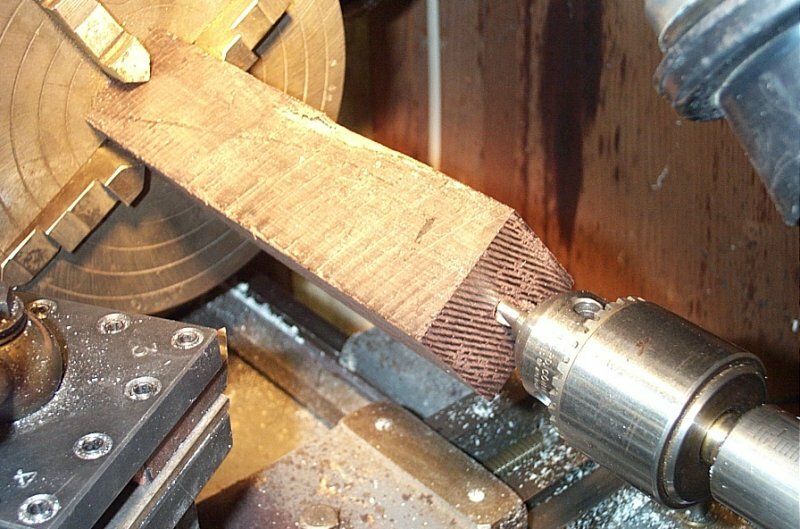 Since I'm using a metal lathe with power feed, I can take a very deep cut from the end grain, and round the blank faster and much more easily than with a gouge. It's a lot less messy too without all those little chips flying around and getting under my t-shirt! 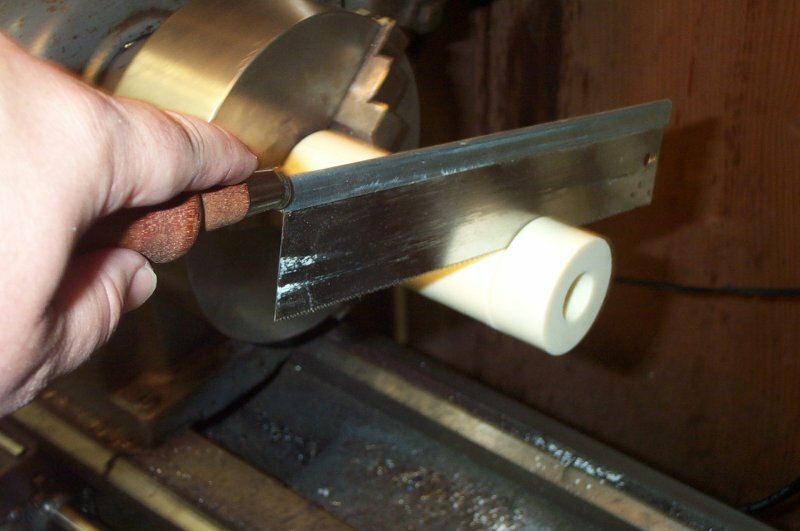 This initial cut creates a smooth surface for the follow rest to ride on. 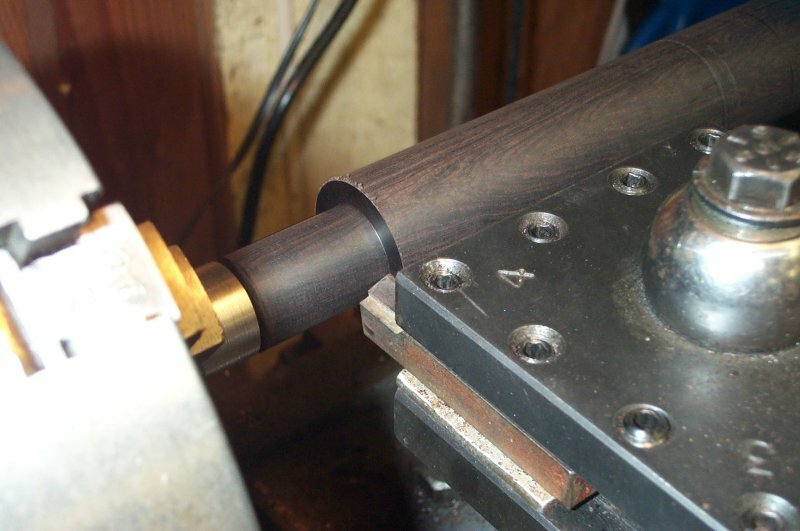 The follow rest attaches to the lathe apron and will support the stock for center boring. 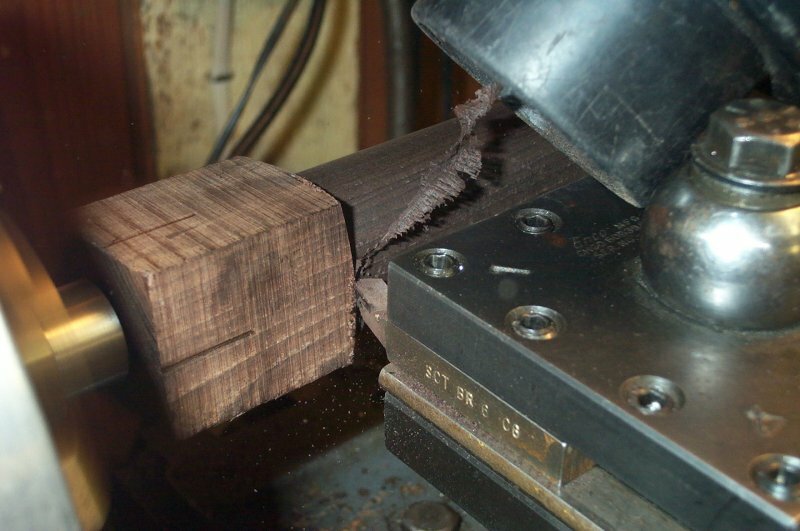 The other end of the blank will remain chucked in the 4-jaw chuck during the center boring process. This shows the stock in the steady rest with the initial pilot drill. This will start a hole that acts as a bushing to guide the gundrill. Here is the follow rest positioned on the stock and a roller bearing held in the tool changer. The follow rest touches the stock on the top and back side. 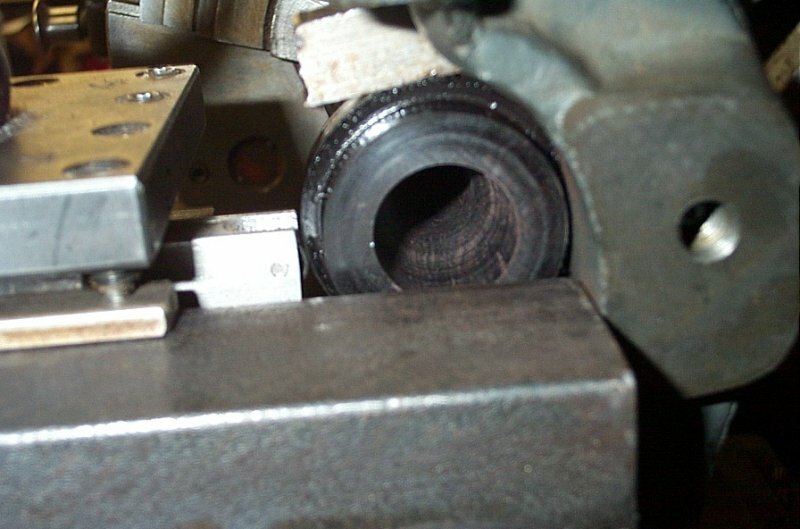 The roller bearing is on the front and below center to make the third contact point. A little oil on the wood is all it needs to run smooth and cool. 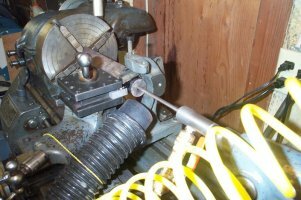 A pilot hole is drilled in the end of the stock and acts as a starting bushing to guide the gundrill. This is the same shot showing the compressed air valve and fitting attached to the gundrill driver and all ready to go. The gundrill is held in the tail stock of the lathe with a Morse taper. 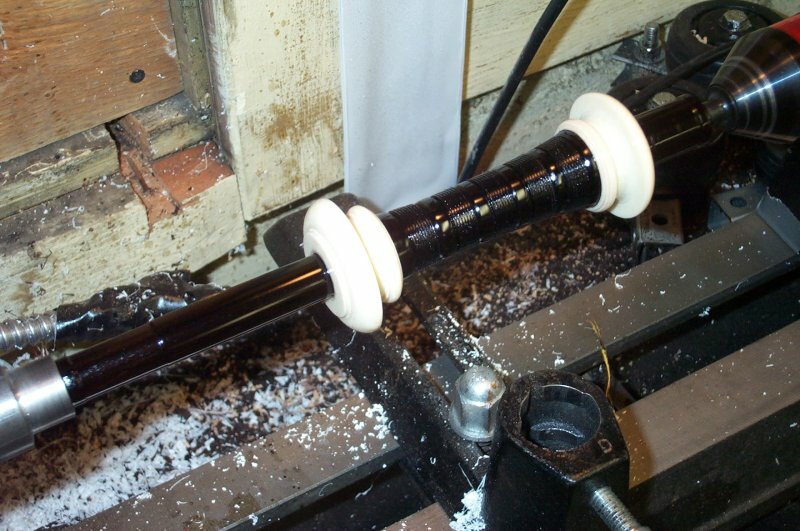 The stock spins driven by the 4-jaw chuck and the tail stock is pushed forward into the stock on the bed of the lathe. This shows the gundrill almost all the way through. 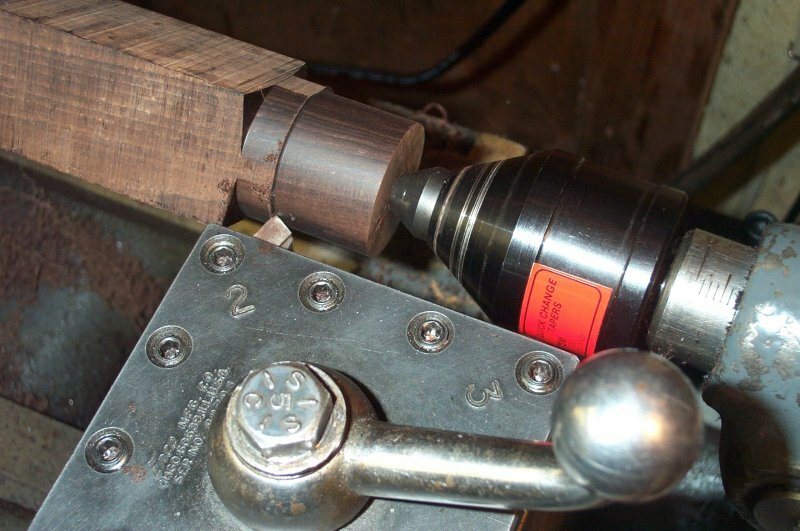 This 5/16" diameter drill bores through the blackwood in less than a minute. 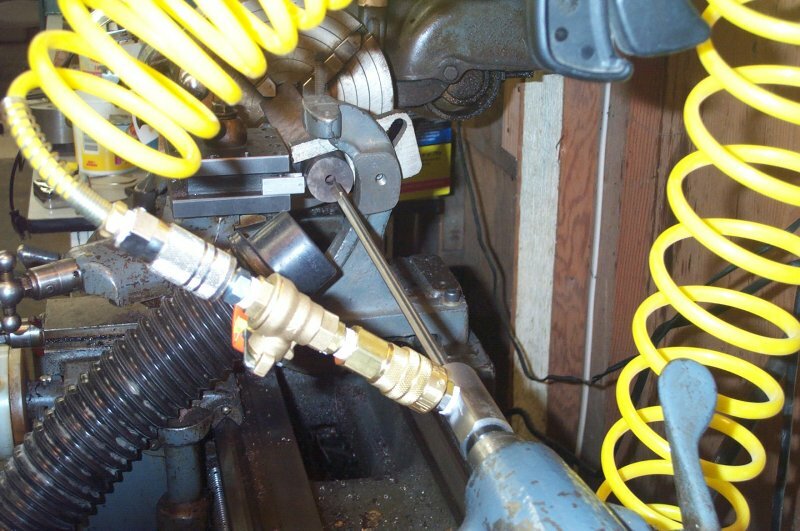 Compressed air is used to clear the chips from the hole as the drill moves through the stock. Spinning the stock instead of the drill helps keep the drill aligned with the center of rotation. 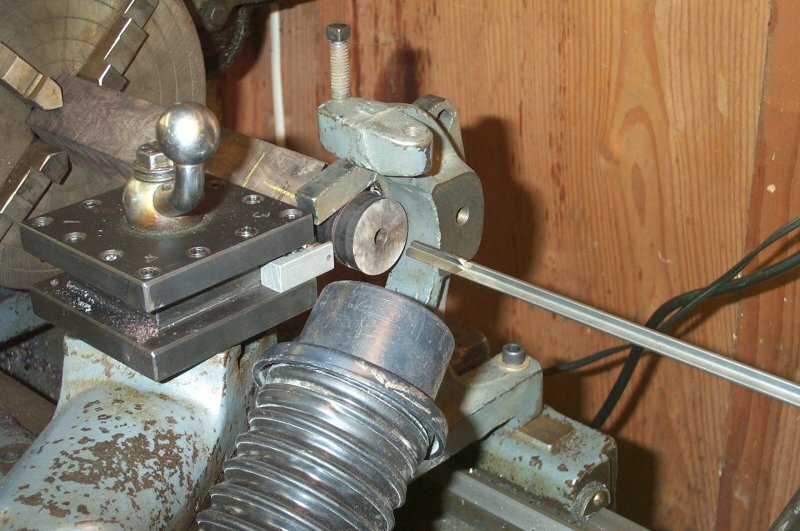 Next, the blank is rechucked on the center hole using a mandrel in the self-centering 3-jaw chuck. From this point on, everything is centered based on the bore location. That's why it is done first. It wouldn't do to have the center bore off-center now would it? This shot shows the roughing pass almost finished. See the ribbon of blackwood going up into the dust collector hose? Sharp carbide tools are a must. Blackwood has a severe dulling effect on tools. 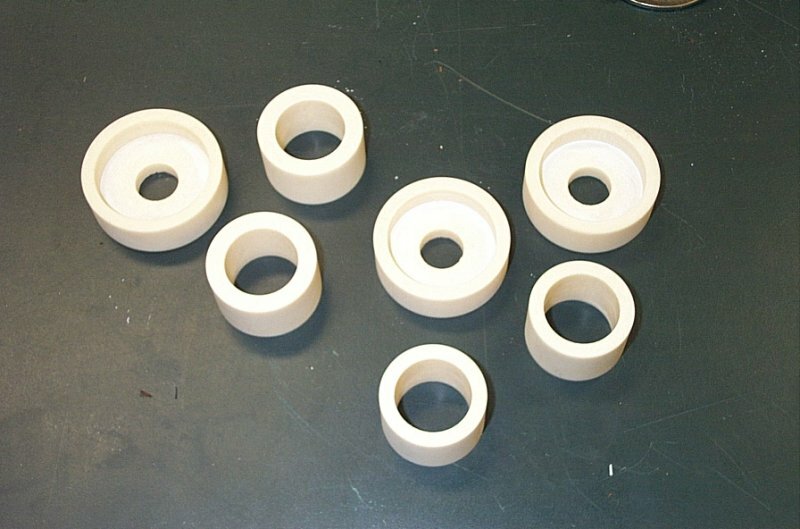 Next, general sizing cuts are made to establish basic diameters of the drone section. 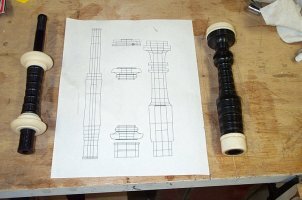 There are five: Reed seat boss, internal mount shoulder, tone chamber, another mount shoulder, and the pin. This cut shows the internal mount shoulder on the reed seat boss end. the reed seat boss is only 1/32" smaller. This shot shows the sizing pass on the pin end of the drone section. 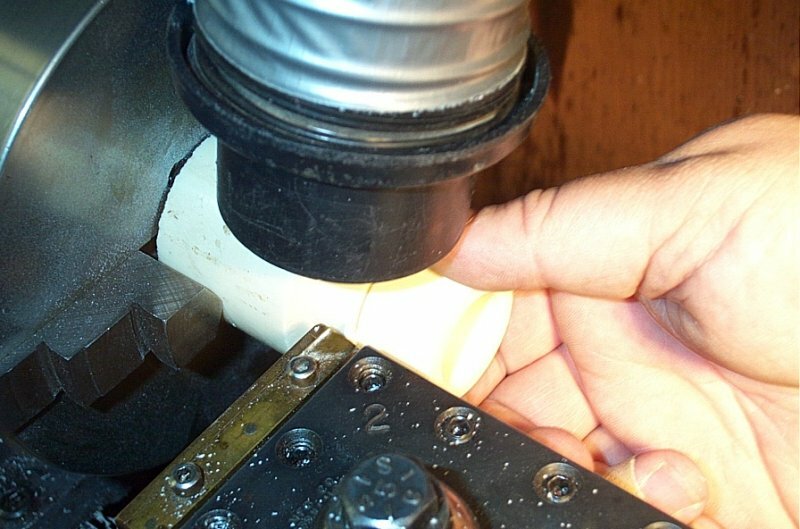 This diameter is the shoulder for the projecting imitation ivory mount. This cut will go all the way to the pencil line to the left. 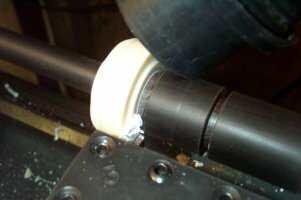 After this the actual pin diameter is cut in a single pass. Here you can see a blank of imitation ivory held in the 3-jaw self-centering chuck. The tail stock is now holding a drill chuck with a center drill. 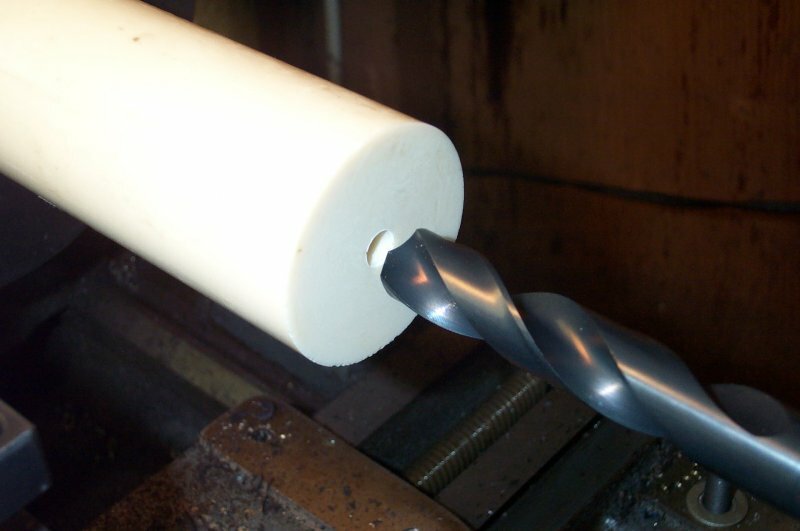 The center drill establishes the center of the stock for later drilling or centering operations. This shot shows the center drilled hole. 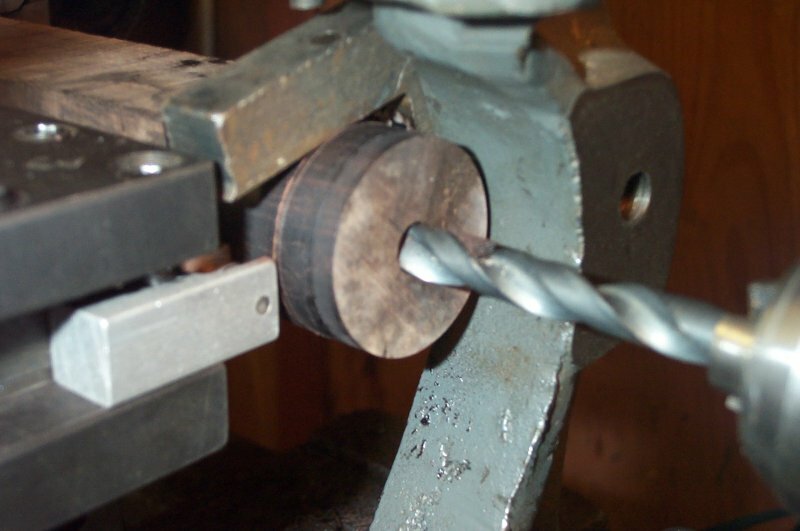 The center drill has been replaced with a twist drill the same size as the finished pin. 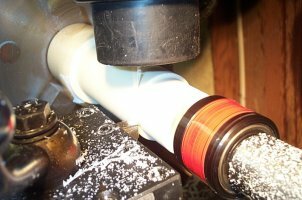 This will drill the small diameter needed inside the mount. Now I have changed the drill to a 7/8" diameter bit. This is the larger diameter for the shoulder in the mount towards the tone chamber. It will only go part of the way through the mount blank. Here is have changed the drill chuck with a live center. The live center holds the drilled end of the stock. 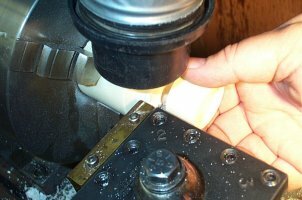 I am driving a cutoff blade into the side of the stock to trim off a projecting mount blank. The cutoff tool isn't quite long enough to cut all the way through the 2" ivory rod. Here I am using a dovetail saw to complete the cut. I need two of these mount blanks for the lower tenor drone section. They are the same except for the smaller diameter hole. One is the diameter of the pin and the other is the diameter of the reed seat boss. Now it's beginning to look a little like a drone section don't you think? 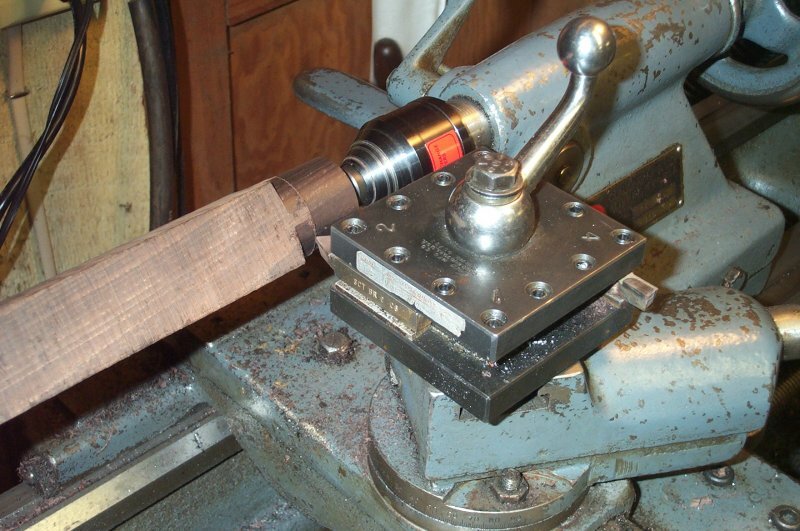 Here I'm clamping the mount blanks to the blackwood. I'm using epoxy to join them together. The final shaping of the drone and mounts is done together. 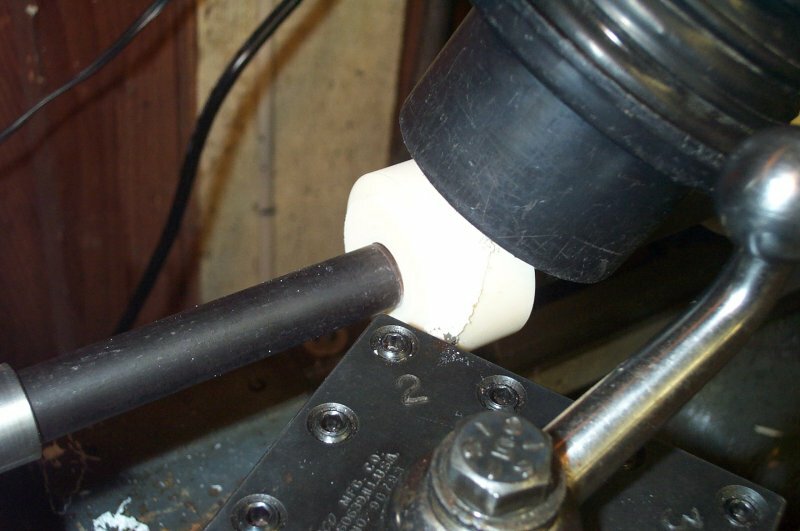 I have remounted the drone section back on the lathe and I'm rough shaping the mount on the pin end to rough shape. Here I am rough profiling the other side of the same mount. This view also shows the depth groove that I'll shape the center section down to. 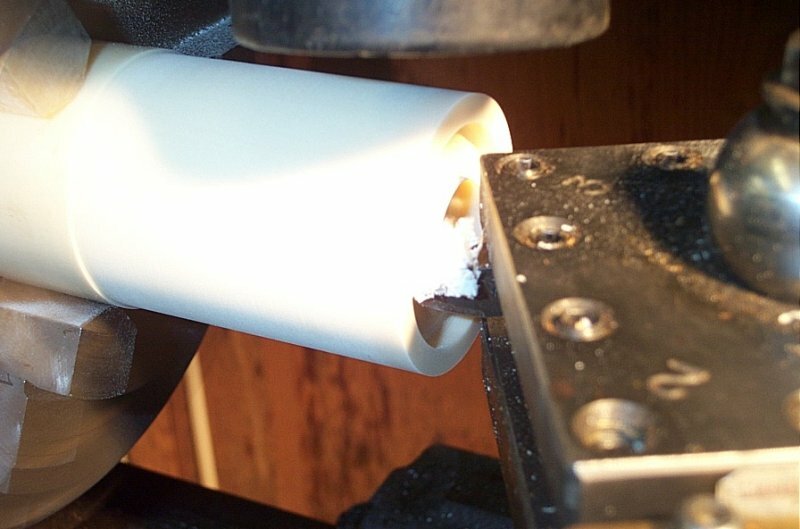 this groove is cut with a hand held parting tool. 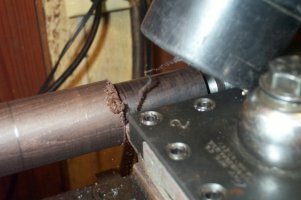 After rough profiling, I replace the indexing tool post with a piece of angle iron attached to the apron much like the tool rest on a wood lathe. Then I use small scrapers to do the beading and smooth to the final shape. 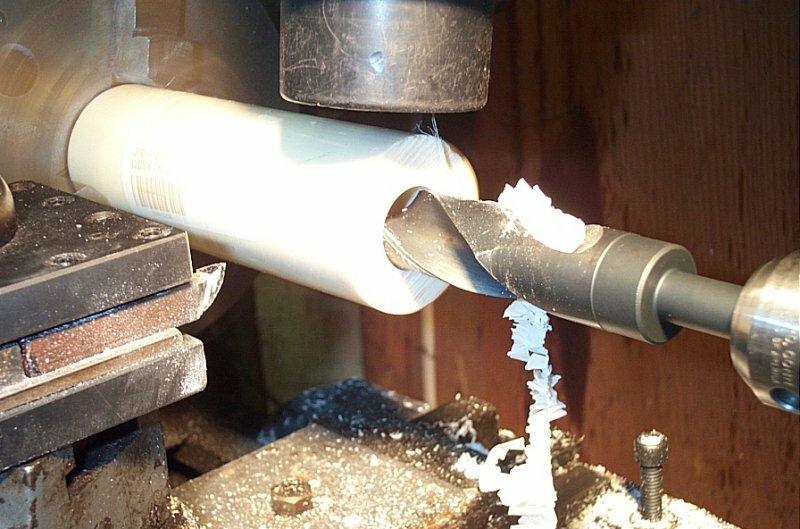 Notice how the area shaped with hand held scrapers is not as smooth as those cut with carbide cutters. 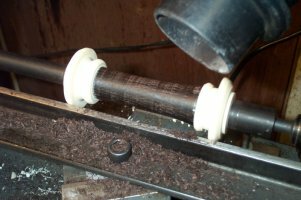 Now I have finished the beading and combing and moved the drone section to the wood lathe for sanding. 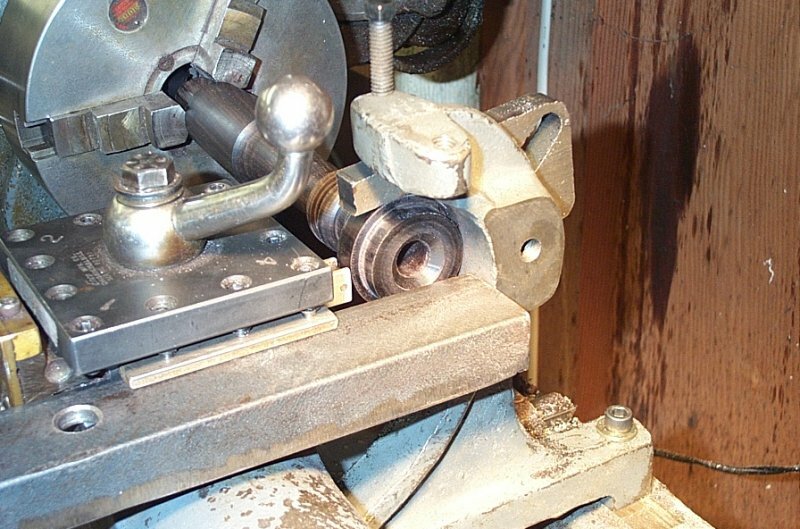 The wood lathe spins much faster than the metal lathe. I sand through a schedule ending with 600 grit. After sanding I use automotive polishing compound to gloss up the blackwood and the ivory mounts. After that I spin on a thin coat of tung oil. This shot was taken just after applying the oil. The basic steps are much the same including center boring, roughing the cylinder, cutting primary diameters, making and attaching projecting mount blanks, and final profile turning. On this upper section, I started with making the mount blanks. After facing and center drilling, I drilled a 5/8" hole that is the opening in the cap. After drilling the cap hole, I have stabilized the ivory with the live center and I'm turning the diameter down to 1-7/8", the size of the bass drone cap. After removing the live center, I'm hollowing out the underside of the cap by 3/8". With a 1/2" finished thickness, this will leave a top 1/8" thick. I made one this size for the bass drone. Then I turned the cylinder down to 1-3/4" for the two tenor drone caps. They were turned the same way. 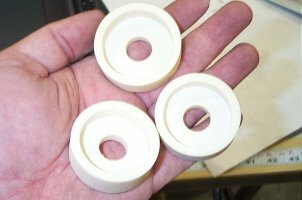 Here are the three cap blanks finished to this stage. Their finished profiles will be turned after epoxying them to the blackwood. 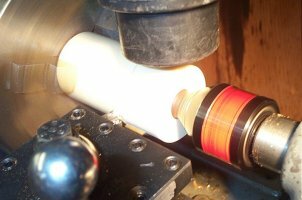 Finish turning will reveal the lip around the center hole and the protruding rim at the base. This shows drilling the center again. 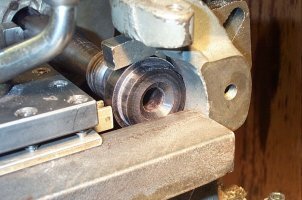 This time it is a 1" diameter bit for the ferrules. 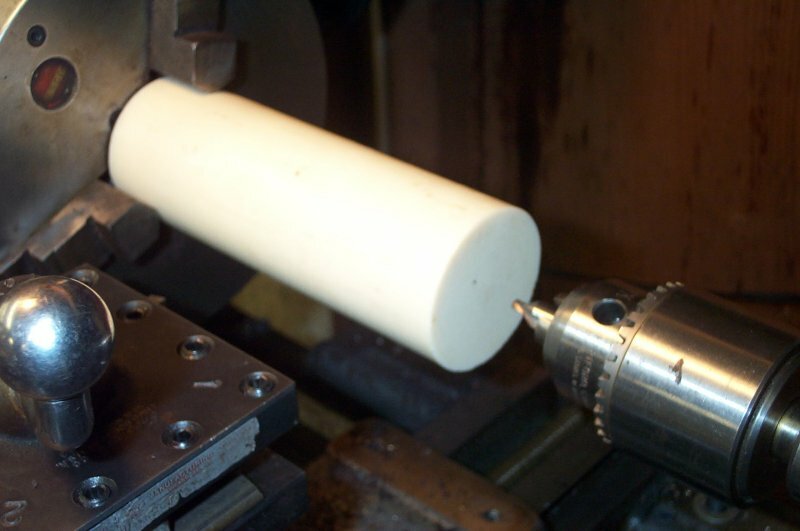 Imitation ivory must be turned relatively slowly. Faster than 500 rpm and it is likely to shatter. It also form best with a negative rake tool. The excess material is scraped off instead of slicing it off as a positive rake would do. After center drilling, I'm turning the diameter down to 1-1/2". Here the parting tool is starting the cut to trim off a ferrule blank from the drilled rod. The rod is spinning in my lightly held fingers to catch it when it parts from the rod. Here the ferrule blank has just parted and fallen off in my hand. Here are the completed mount blanks. The three on the left are for the bass drone and the 4 on the right are for the tenor drones. This shot shows a billet in the 4 jaw chuck being center drilled to accept a live center. Just like the lower drone section, the next steps are to turn a land for the follow rest, gundrill the bore to 9/16", re-chuck on the bore, rough turn the external diameters, and finish turn the final profile. Since those steps were shown in the lower section, I skipped them here. This shows one of my more "creative" tool set ups. 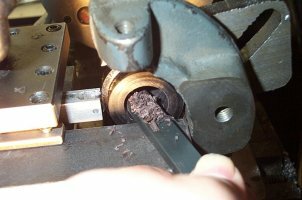 The boss for the ferrule is held in the three jaw chuck. The follow rest is installed on the lathe apron and the tool holder is holding a roller bearing to firmly hold the rotating work piece. This left me without a tool holder. 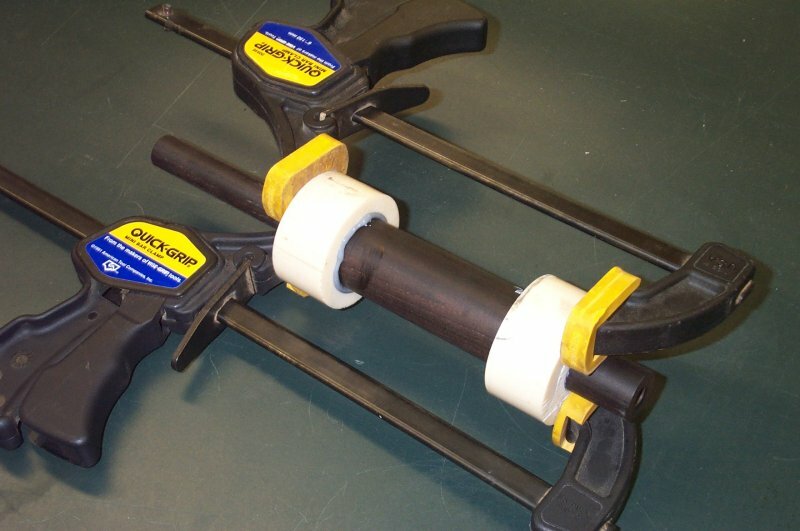 I clamped a piece of inverted angle iron in the side of the indexing tool holder to act as a rest for a hand scraper. Please don't show this setup to a real machinist. I'll loose bragging rights! Here you can see me working the scraper inside the bell to shape it. This is the only "done by feel part of the operation. The bell is 1" deep and completely blind to cut. Now you can see the finished bell profile. 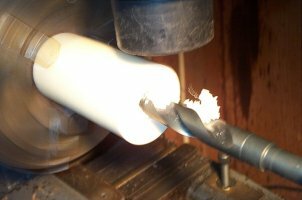 This phase of the bore shaping is the most variable and my account for the biggest differences between examples of the same brand of pipes. Without modern machinery and custom cutters, it is impossible to make the bell shape exact between individual pipes. I tried to follow a generally parabolic curve in turning the bell profile. The bell profile and depth, the bore diameter relationships, and the location and length of the tone chamber, all come into play in shaping the sound. These will be the variables I'll play with in changing the drone sound. Here is a shot of the completed tenor drone sections, sanded and oiled along side a 1:1 scale print out of my model. In a week or so, after the oil cures, I apply a coat or two of shellac. I modeled the drone parts in Rhino, a Windows based NURBS modeler and checked the model against the x-ray images Dr. Jack sent me. I used this model to check dimensions and locations as I made the parts along the way. Next on the list will be hemping up the drone and having my instructor run it around the block. If it sounds good, I'll make another. If it has problems, we'll come up with a plan, modify the design and try again!